We’d love your help. 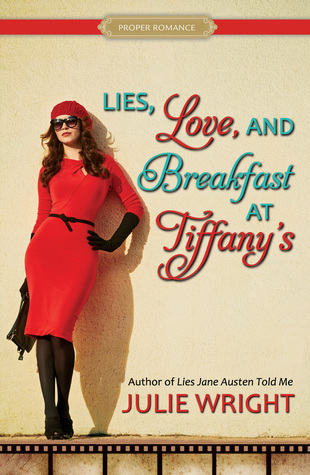 Let us know what’s wrong with this preview of Lies, Love, and Breakfast at Tiffany's by Julie Wright. To ask other readers questions about Lies, Love, and Breakfast at Tiffany's, please sign up. Silvia is a film editor and she's good at what she does, but has had to fight to get to where she is. I love that she's strong and not a person to back down when treated unfairly. She's a very quirky, confident woman, yet she ha Hollywood isn't all it's made out to be and Silvia learns that the hard way. I love old movies and the glitz and glamor of a famous lifestyle, but a lot of it is simply a facade. Basing this one on Audrey Hepburn was pure genius, especially the "object" with her namesake. This was a lovely read. Silvia's journey into editing films and production is rough and hard as she navigates being an assistant to a director who isn't engaged in his film. Her relationship with Ben, as a friend at a rival studio (her former place of employment, and former co-worker) is tricky, and seems to be met with road blocks in myriad forms. Silvia's family, her friends, her job, and of course, Ben meld together to make a lovely romantic read, and more than just a romance. Life, work, real life, love and happiness all rolled together. Beautiful, lush read, with problems, lovely romantic moments, and a lovely HEA. I think I enjoyed this much more than many 'Hollywood' set novels I have read recently. Well-done, and well-earned 4 from me (not given frequently). I think my favorite of all of her books I have read. Can't wait to read her next work. Silvia Bradshaw is trying to make it in what still seems to be a man's world--a film editor in Hollywood. Well, she beat cancer at the age of five, although she lost an eye in the fight, and she would prove she could make it in the often ruthless world of Hollywood. When she was a child Silvia named her glass eye "Audrey" after Audrey Hepburn. Ben is also a film editor who used to work with Silvia, and he helped her get her new job at this bigger studio. Because he was her boss at her former job they never dated, but there's nothing holding them back now. Ben is a great guy!! Silvia's grandma is a big part of her life. She's the one who introduced Silvia to Audrey Hepburn movies. She's a riot and is always telling Silvia "Don't be sassy." For some reason I picture her as an older Suzanne Sugarbaker--sassy and dressed to the nines. Emma is Silvia's best friend who's always there for her. They accept each others faults and quirks--isn't that what best friends are for? Emma has her own story in Lies Jane Austen Told Me Emma is funny and I thought one of the funniest things she said was when Silvia was having trouble admitting that Ben was a "hottie". "Why? I know you're down an eye, but your left one still works, doesn't it?" I died laughing. I loved Silvia's relationship with her grandma and her bestie, Emma. She and Ben were great together and had to figure out where they wanted their relationship to go. One of my favorite parts was when they did the scene from Dirty Dancing--"Silvia?" "Yes, Mickey?" It was super fun to hear Julie Wright say she and her best friend Silvia do that All. The. Time. How cool and funny is it that that made into this book? One of my favorite parts in the book is when Silvia's boss gets stinking drunk and she has to get him ready to present the film that she alone has worked on, and he tries to take credit for the film. But he wasn't going to get away with it. People always said that my ability to call people on their crap was my superpower. It was time to get super. Silvia was no longer going to be the one doing the work while others took credit for it! This book is a hoot! And with wonderful depth! Isn't that a great combination? First of all, I will forever remember the unique main character- Silvia had cancer as a five year old which left her with inner scars as well as outer- she lost her eye and has a glass eye she named Audrey (the little details about her vision and glass eye as an adult are fascinating!) Her fears stemming from her experiences in the hospital influence her relationships and priorities. I loved that she is strong and amb This book is a hoot! And with wonderful depth! Isn't that a great combination? First of all, I will forever remember the unique main character- Silvia had cancer as a five year old which left her with inner scars as well as outer- she lost her eye and has a glass eye she named Audrey (the little details about her vision and glass eye as an adult are fascinating!) Her fears stemming from her experiences in the hospital influence her relationships and priorities. I loved that she is strong and ambitious in a cutthroat Hollywood career, but also struggles with vulnerability and confidence at times. Ben is pretty awesome, and unrequited love (that is eventually rewarded) is one of my favorite tropes! He and Silvia have a comfortable friendship, fun banter, and quirky mannerisms that really made them come to life. It was interesting to see Ben as the vulnerable one as he shares his long-time angst over his romantic feelings and sadness when they had drifted apart. Their chemistry is amazing and only grows as Silvia sorts through her feelings for Ben. She has a loyal friend in Emma and her grandmother, and I enjoyed the dynamic they each brought to Silvia's life. She learns important lessons through the obstacles she faces and grows as she begins to model her life into one of compassion like the real-life Audrey Hepburn. This is a book not to miss! This “proper romance” was so much fun! I loved how even the word “proper” got it’s own cameo. It’s great when modern day romances (set in Hollywood even!) can be clean and still thoroughly enjoyable. There wasn’t anything missing from this lovely romance! Great read for anyone in the mood for something quick, lighthearted and feel-good. Also anyone interested in film and film editing and Audrey Hepburn would particularly enjoy. I am not generally a romance reader, since I prefer a good rom-com to an over-the-top bodice-ripper. But I gave this book a chance after receiving a copy at BookCon, and tore through in a weekend with pleasure. The gimmick to this rom-com is the protagonist’s connection to Audrey Hepburn; but the more interesting thing about it is that it takes place in the industry of Hollywood – not the glitz and glamour of acting, but in film editing. Silvia is a smart and talented film editor trying to get ah I am not generally a romance reader, since I prefer a good rom-com to an over-the-top bodice-ripper. But I gave this book a chance after receiving a copy at BookCon, and tore through in a weekend with pleasure. The gimmick to this rom-com is the protagonist’s connection to Audrey Hepburn; but the more interesting thing about it is that it takes place in the industry of Hollywood – not the glitz and glamour of acting, but in film editing. Silvia is a smart and talented film editor trying to get ahead in a male-dominated Hollywood industry, and that takes up just as much of the pages and Silvia’s mental energy as the romance. It was an interesting spotlight on a position most folks don’t even think about. The Hollywood setting lends the book a specificity and an authenticity. Silvia and Ben don’t just talk about nothing or chat mindlessly; they debate classic films in a way that’s instantly recognizable to anyone with a passion for movies – or anyone with a passion for anything, even as the particulars go over your head. The cast is filled out with Silvia’s lovely best friend Emma, and Silvia’s wonderfully sassy grandma. Another thing that differentiates this book from its genre is that Silvia is disabled – she has one eye, after losing the other one to cancer as a child. I have to tip my hat to Julie Wright for her deft handling here. The cyclopean nature of the protagonist was very much a part of the story, but it never derailed the story. It was just a feature, same as her choice of career or her innate compassion for people. Let’s start with Silvia. There are so many great things about her. She’s a woman working hard as a film editor. And when I say working hard, I mean that she’s doing her own job and her bosses and she’s doing a great job of covering that last bit up. Silvia has so many things going for her, yo I have never been even a little bit disappointed by one of these Proper Romances. And this one was no exception. In fact, this one might be my favorite Proper Romance I’ve read. I loved everything about it! Silvia and Ben have history. It's like a careful dance around each other without ever coming together for one reason or another. It's comical and also a little maddening. I loved the easy banter and movie quoting which reminded me of my kids. They are always quoting lines from movies to see who will get it. (I hardly ever do.) What a fun book! I love books with smart, witty and strong female characters and this book had a couple with Silvia and her grandma. They both brought a smile to my face. I should have known better than to start Julie's book when I didn't really have time to just sit and read. Less than a day later, I had devoured it. My kids came home from school too early and naps not long enough, but I couldn't read it fast enough. This was an incredible fun story. I always enjoy being where I haven't been and this book was all over that. I loved Silvia's drive, and Ben's loyalty and how everything turned out in the end. For a couple of chapters I thought I would be mad at the I should have known better than to start Julie's book when I didn't really have time to just sit and read. Less than a day later, I had devoured it. My kids came home from school too early and naps not long enough, but I couldn't read it fast enough. This was an incredible fun story. I always enjoy being where I haven't been and this book was all over that. I loved Silvia's drive, and Ben's loyalty and how everything turned out in the end. For a couple of chapters I thought I would be mad at the ending, but it ended perfectly. I highly recommend this book. Silvia Bradshaw is an assistant film editor, working on a major film--and she has a huge problem since her boss seems completely incapable of doing his job. When she goes to a club to drag him back to the studio to finalize the film just hours before their deadline, she gets an unexpected ally in her former coworker Ben Mason. Not only does Ben help her get her drunk boss back to the office, but when said boss passes out, Ben helps Silvia finish the edits. Silvia soon finds herself looking at Be Silvia Bradshaw is an assistant film editor, working on a major film--and she has a huge problem since her boss seems completely incapable of doing his job. When she goes to a club to drag him back to the studio to finalize the film just hours before their deadline, she gets an unexpected ally in her former coworker Ben Mason. Not only does Ben help her get her drunk boss back to the office, but when said boss passes out, Ben helps Silvia finish the edits. Silvia soon finds herself looking at Ben in a new light--only to find that he has reconnected with an old girlfriend. While Silvia loves being his friend, she also has to respect his relationship, as hard as it is to smother her feelings. With a little guidance from her grandma, her best friend, and Audrey Hepburn, Silvia will decide what she really wants in life and how she's going to get it. This is a fun contemporary romance. Silvia's a pretty dynamic personality--she gets major points for telling it like it is--and Ben's a total sweetie. I thought the film editing aspect of the plot was really interesting, but I wasn't in love with the constant movie quotes and references and getting inspiration from movies. However, I think that is just because of my tastes, not because of any problem with the book. (I'm not a big movie watcher, and I've only seen a couple of Audrey Hepburn's movies--and I have NOT seen Breakfast at Tiffany's. So that aspect of the book wasn't my favorite, but I think other readers will be totally fine with it. For me, it's a 3.5-star book, but I can easily see other readers rating it higher, because, again, I'm just not that into movies. Great characters (including some of the secondary characters), and a cool plot make this a really nice clean, contemporary romance. Working in Hollywood is not easy. Silvia discovers this as she starts a new job with a difficult boss and as one of the few women working in the office. As an up and coming film editor Silvia is part of a dog-eat-dog world where people are always looking for a leg up. One of Silvia's biggest inspirations is Audrey Hepburn, at the start of every chapter there are quotes from movies that Audrey Hepburn starred in. This is a follow-up to Julie Wrights 'Lies Jane Austen Told Me' although you don't ha Working in Hollywood is not easy. Silvia discovers this as she starts a new job with a difficult boss and as one of the few women working in the office. As an up and coming film editor Silvia is part of a dog-eat-dog world where people are always looking for a leg up. One of Silvia's biggest inspirations is Audrey Hepburn, at the start of every chapter there are quotes from movies that Audrey Hepburn starred in. This is a follow-up to Julie Wrights 'Lies Jane Austen Told Me' although you don't have to read one before the other. I enjoyed the quotes from Audrey Hepburns movies, it definitely made it easier for me to relate to Silvia more. I felt like this book had enough surprises that it wasn't predictable but not enough that it wasn't believable. Once again I'm swept away by a story from author Julie Wright. She has written in so many genres and I've liked all of them. Lies. Love, and Breakfast at Tiffany's is based in the world of Hollywood...not the actors, but the behind the scenes world of film editing. It was very interesting and I really liked all of the lines from various movies that main character Silvia and her good friend Ben would tease back and forth. The witty dialogue between Silvia and Ben is one of my favorite things in t Once again I'm swept away by a story from author Julie Wright. She has written in so many genres and I've liked all of them. Lies. Love, and Breakfast at Tiffany's is based in the world of Hollywood...not the actors, but the behind the scenes world of film editing. It was very interesting and I really liked all of the lines from various movies that main character Silvia and her good friend Ben would tease back and forth. The witty dialogue between Silvia and Ben is one of my favorite things in this book. There are so many unique things about Silvia, including how she survived cancer at a young age and lost her eye to the disease, she ended up getting a glass eye, and she named her eye "Audrey" after actress Audrey Hepburn. I also like how driven Silvia is to succeed and her very lively personality that helps her get through many obstacles in the way. Ben is a true gentleman and a big sweetheart. You want them to get together in this book, but it's like an awkward dance the whole time getting to that final outcome. It's sounds like my life all the way! 😂😂😂😂😂😂😂😂😂😂😂😂At times you to have to laugh or you'd cry a lot. Being a film editor in Hollywood for a major movie studio isn’t as glamorous as people might think. Silvia Bradshaw knows it’s a cutthroat world, but she’s determined to make a name for herself. Her boss makes it really difficult, but her determination keeps her going. Her old friend Ben Mason, also, keeps her going. He works for a rival studio, but he and Silvia have been close friends for years. The friendship becomes romance and just when it seems like they will have their happy ending, the ri Being a film editor in Hollywood for a major movie studio isn’t as glamorous as people might think. Silvia Bradshaw knows it’s a cutthroat world, but she’s determined to make a name for herself. Her boss makes it really difficult, but her determination keeps her going. Her old friend Ben Mason, also, keeps her going. He works for a rival studio, but he and Silvia have been close friends for years. The friendship becomes romance and just when it seems like they will have their happy ending, the rival studios toss legalities into the mix and their lives are turned upside down. The author takes us right into the heart of the Hollywood world. Each chapter begins with a quote from an Audrey Hepburn movie character. It’s a clever addition to the story. I don’t want to give too much away, but it left me wanting to have a Hepburn movie marathon. Sometimes I just wanted Silvia and Ben to sit down and talk, but things are never that easy. Watching their love story grow is both fun, dramatic and entertaining. I loved every minute of this story. I wasn’t familiar with the author before, but I am now. I’ll be on the look out for more of her books. The previous one was a take off on Jane Austin which I plan to read. Although there is a character crossover, you absolutely do not have to read it first. It has no bearing on this book. This is a great way to spend a weekend. I totally enjoyed this book. Great characters, a captivating story, and a fascinating setting - what more could I ask for? What I most appreciate about Julie Wright, having read Lies Jane Austen Told Me and now the equally excellent Lies, Love and Breakfast at Tiffanys, is that she takes tropes that might very well read as cliche by a lesser pen and makes them fresh again. The pacing, the structure and the world of film editing are brought to colourful life in a delightful character piece. I loved our unique heroine and her unique world--painted amidst a Los Angeles that becomes its own colourful character and refle What I most appreciate about Julie Wright, having read Lies Jane Austen Told Me and now the equally excellent Lies, Love and Breakfast at Tiffanys, is that she takes tropes that might very well read as cliche by a lesser pen and makes them fresh again. The pacing, the structure and the world of film editing are brought to colourful life in a delightful character piece. I loved our unique heroine and her unique world--painted amidst a Los Angeles that becomes its own colourful character and reflection of the author's obvious love for it. The friends to lovers trope here is well-earned because it rings genuinely and ekes out on pages an absolute delight to read. Indeed, Wright makes this spin fast and warm like the movies Silvia works so painstakingly on. To add to the fresh romance and dimensional supporting cast, Wright expertly places a woman in a man's world and shows the triumphs and travails of an industry where even those with the most talent bow to those with the biggest names. It was a delight to see Silvia grow in personal confidence and demand recognition for her own hard work and talent. There is a lovely connection between this and Lies Jane Austen Told Me ( the heroines of each are best friends) but you can read each as a standalone. I enjoyed Julie Wright’s Lies Jane Austen Told Me last year, so of course I wanted to read Silvia’s book. And, oh, what a delicious one it is! Lies, Love, and Breakfast at Tiffany’s is part Ode to Audrey Hepburn, part critique of the Hollywood boys club, and, my favorite, a friends-to-more romance. While the first half of the book sets up what’s to come, I thoroughly enjoyed getting a look into Silvia and Ben’s friendship—their movie quote game, their comfort and ease with each other, and Ben’s cr I enjoyed Julie Wright’s Lies Jane Austen Told Me last year, so of course I wanted to read Silvia’s book. And, oh, what a delicious one it is! While the first half of the book sets up what’s to come, I thoroughly enjoyed getting a look into Silvia and Ben’s friendship—their movie quote game, their comfort and ease with each other, and Ben’s crazy statistics. These two know each other well. I appreciated the laughs in the book (a few provided by Silvia’s grandmother who I adored and a few more provided by Silvia’s glass eye) but more so, I enjoyed Silvia’s revelations of her feelings for Ben and what she found important in life. This is a book for those who love movies, romance, humor, or a great story. I also appreciate all the nods to the Audrey Hepburn movies. Each chapter starts with a quote from her different movies, and it helped to set the mood while keeping I really loved Silvia's character. She is a working professional. She completed school, and is now paying her dues, so to speak, in the profession is has dreamed of working in. And she's almost reached her goals. The strong independent female angle is true to life in this story, and for that, I'm grateful to Julie Wright for writing. A super cute, fun, quick read. I know this is probably blasphemous but I don’t believe I’ve seen any of Audrey Hepburn’s movies so the references in the book has no meaning for me. But I want to watch her movies now! I also had a hard time getting past the glass eye. I don’t really understand why it grossed me out, but I was. As a movie buff myself and an Audrey Hepburn fan, I appreciated all of the movie references in this book. I did like this book. A audrey Hepburn tribute of teaching about love, being a strong woman, following your passions, of being a friend and an advocate. Lesson learned: communication is key. Working in Hollywood is awful! Being yourself is key to being happy. I did not realize this was a companion book to Lies Jane Austen told me. No you dont have to read it first or at all. This book stands on it's own but this one does take place after. It was a cute read. It was an enjoyable read, but I thought the final conflicts were too implausible. Fun clean light romance with lots of movie references, which makes it even more fun! Sooo, I really really loved Lies Jane Austen Told Me...it’s one of my favorite books and I was so excited to get to read this book early. However, I just couldn’t seem to get into this story. I think some people will love it, especially, old Hollywood/movie fans, but for me it was a struggle. Sylvia is an assistant film editor and you get to see her world of working in Hollywood and how it’s really not that glamorous. I felt like the beginning of the book was so centered around her work world th Sooo, I really really loved Lies Jane Austen Told Me...it’s one of my favorite books and I was so excited to get to read this book early. However, I just couldn’t seem to get into this story. I think some people will love it, especially, old Hollywood/movie fans, but for me it was a struggle. Sylvia is an assistant film editor and you get to see her world of working in Hollywood and how it’s really not that glamorous. I felt like the beginning of the book was so centered around her work world that I wondered if there would even be a love interest. Then, the love interest finally comes in, but it just didn’t hold my interest much. I think mainly because their connection was to quote movie lines and rarely did I know any of the movie lines or movies they were referring to. Both Sylvia and Ben were likable but I struggled to connect to them or feel the chemistry between them. 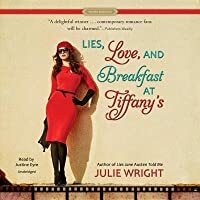 Julie Wright has a new book out called, Lies, Love, and Breakfast at Tiffany's. I really enjoyed her last book, Lies Jane Austen Told Me, and was excited to read Silvia's story. It did not disappoint! Julie Wright has such a witty and fun writing style. It's like I'm right there with the characters experiencing the twists and turns through life with them. In Lies, Love, and Breakfast at Tiffany's, Silvia is trying to make it as an editor in the film industry. She lands what was supposed to be a d Julie Wright has a new book out called, Lies, Love, and Breakfast at Tiffany's. I really enjoyed her last book, Lies Jane Austen Told Me, and was excited to read Silvia's story. It did not disappoint! Julie Wright has such a witty and fun writing style. It's like I'm right there with the characters experiencing the twists and turns through life with them. In Lies, Love, and Breakfast at Tiffany's, Silvia is trying to make it as an editor in the film industry. She lands what was supposed to be a dream job, but her boss is a nightmare. In trying to save the film they're working on, she turns to her old colleague Ben, who gladly helps her out. And in that moment, she realizes that Ben might not be in the friend-zone anymore for her. But does he feel the same way? Silvia is such a rich character. She has a job that she's trying to maneuver, an opportunity to explore her feelings with Ben, but she also deals with prejudice against women in the workplace, a grandma who is hiding something, and some remnants of fear from her childhood cancer. Mingled with all of this is movie quotes and Audrey Hepburn moments because of Silvia's special connection to her. I love how the author was able to seamlessly pull together a character and truly breathe life into her--so much that she feels like a friend! All of the characters were so well done, from the hero to the boss to the assistant. But another real standout for me was how much I learned about what a film editor does. The research was incredible and so woven into the story that I closed the book with a new appreciation for what I see on the credits of a movie. Of course this is a romance and if you don't fall in love with Ben, then you might not have a pulse. He's so swoony and quirky and everything you want in a romantic hero. Their journey to love is so bumpy in this story, and you'll want to see that happy ending so bad that you'll take the book everywhere with you and be turning the pages at every red light until someone honks at you. It's that good. I loved this one. Julie Wright does a beautiful job of describing emotion well enough to convey to the reader not just the feeling of a scene or a setting, the but the emotions of her characters. Enough so that you draw a connection emotionally to the characters in the book, making them come alive. Julie couching the plot in Silvia's search for happiness was a beautiful way to mirror that both Audrey and Silvia are more than their looks. Just as Silvia's character was discovering that happiness comes from the insi Julie Wright does a beautiful job of describing emotion well enough to convey to the reader not just the feeling of a scene or a setting, the but the emotions of her characters. Enough so that you draw a connection emotionally to the characters in the book, making them come alive. Julie couching the plot in Silvia's search for happiness was a beautiful way to mirror that both Audrey and Silvia are more than their looks. Just as Silvia's character was discovering that happiness comes from the inside, not the outside, so does our goodness and beauty. The author's metaphor between the two ideas gave depth to the plot. Julie Wright wrote her first book when she was fifteen. She's written over twenty novels since then. She is represented by Sara Crowe. She is a Whitney Awards winner for best romance with her book Cross My Heart and a Crown Heart recipient for the novel The Fortune Café. She loves Julie Wright wrote her first book when she was fifteen. She's written over twenty novels since then. She is represented by Sara Crowe. She is a Whitney Awards winner for best romance with her book Cross My Heart and a Crown Heart recipient for the novel The Fortune Café.